NYP/Columbia was among the first to offer patients access to Heartmate 3, the newest LVAD technology, in a clinical trial testing it against current standard of treatment, the Heart Mate II. In a randomized study reported in New England Journal of Medicine and presented at American Heart Association in November 2016, lead investigator Yoshifumi Naka, MD, PhD, reported fewer complications with the Heartmate 3, noting a marked improvement over Heartmate II. 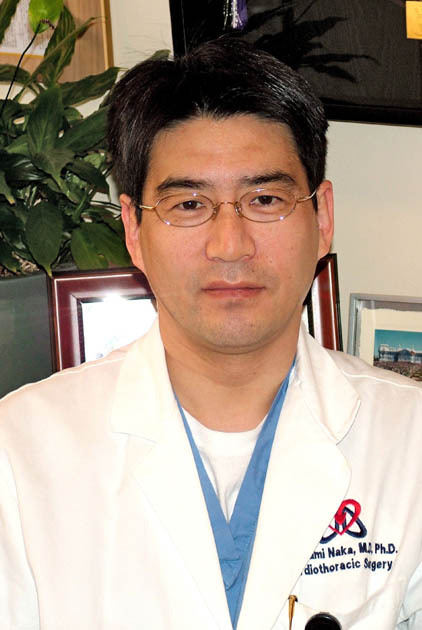 Dr. Naka, the first author of this landmark paper, is director of Columbia’s Cardiac Transplantation Program and Mechanical Circulatory Support Program, and Columbia enrolled the largest number of patients in this trial. Other news: Columbia surgeons are now using minimally invasive VADS in seriously ill patients requiring a short-term device. This type of LVAD can be implanted with a small left thoracotomy. It is then linked to an axillary artery through a tiny incision below the right clavicle. Columbia’s volume of heart transplants continues to be the largest in New York area and the one of the largest in the country. One of the growing difficulties of contemporary heart transplantation is primary graft failure. Columbia has a unique solution and is using ECMO to treat these patients, with excellent results. Performing over 80 ECMO procedures a year, our ECMO team runs one of the only 5 Platinum Level programs recognized by ELSO, international organization for ECMO. Please call 212.305.7013 to refer a patient.